This could be an essential ingredient of your tone that you don't want to turn off. Easy to use. Rich tone boost. 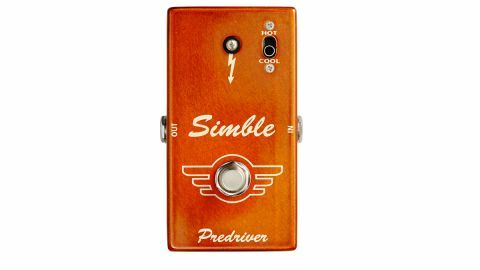 The Simble Predriver is described as a preamp/booster/compressor/upper harmonic enhancer. While that may sound complicated, the pedal is far from it: it has no knobs and just two toggle switch-selected settings, Hot and Cool, representing different amounts of boost up to a max of 10dB. The Simble lies in classic tone-conditioner territory - it's a pedal to improve your sound that can either be kicked in for extra boost, or just left on permanently. With a clean amp and the Cool setting, you get a tone that seems automatically richer with extra sustain and a nice touch of grit. The Hot setting goes further and dirtier, adding a few more dB of boost and a touch more midrange. There's great sensitivity to picking and also to guitar volume, if you want to leave it on full-time and control things with your volume knob. It's great for pushing a dirt pedal or used just in front of your amp. making it a brilliant tone sweetener.